I have found it really frustrating being off work and not being able to do much baking but I was really craving cheese straws and had some dried up cheddar in the fridge so thought I would put it to good use by grating it and drying it out a bit further as who likes soggy cheese straws? If you don’t have dried and past its best extra mature cheddar lurking in the fridge you can use Parmesan cheese. Add the flour to a large mixing bowl, then the butter and rub in until the mixture resembles coarse breadcrumbs. Stir in all but 2 tbsp of cheese, the mustard powder, nutmeg and pepper. Add around 4 tbsps of iced water, a tbsp at a time to bring the mixture together into a firm dough then wrap in cling film and chill in the fridge for 30 minutes. Pre heat the oven to 200c or gas mark 6. Roll the pastry out to a rectangle approximately 5mm thick then brush with the beaten egg and sprinkle over the remaining cheese. 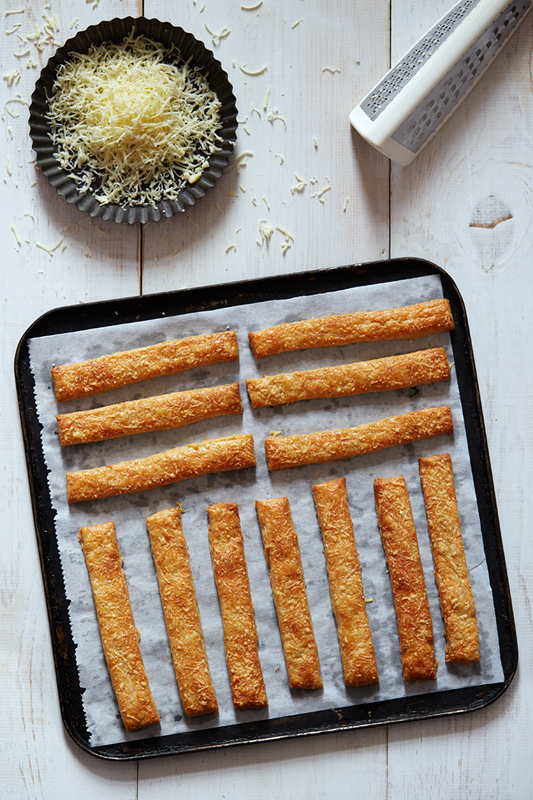 Cut into strips 1cm wide and 10-14 cm long depending on the size of your rectangle and arrange on a lined baking tray. Bake for around 15-20 minutes until the straws are golden brown then transfer to a rack to cool and firm up. They are best eaten warm but if you need to make them ahead, leave them to crisp up in a low oven (around 100c or gas mark 3) before storing in an airtight container.